The Tube Fly Conversion will accomodate all normal size plastic and metal tubes. Softer (plastic) tubes are supported by mandrels. Tubes are secured in a collet so they are perfectly centered and will not slip. Included is a Front Hub with four collets and four matching madrels. The Automatic Bobbin Kit is a great starter package. 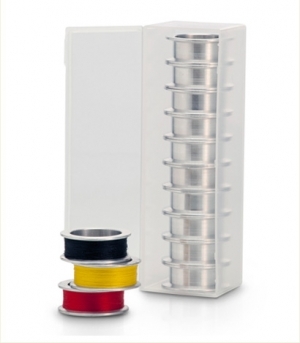 It includes an Automatic Bobbin (with ceramic tube), three additional machined aluminum spools (four, including the one on the Bobbin) a spooling Arbor to load your thread onto the aluminum spool, and instructions.